Hello friends and happy Monday to you! I am officially on my Christmas break and it feels so good! I was sick all last week with laryngitis and by the weekend I could barely talk at all. Not so good since I had shopping to finish, a Christmas party to attend, an outing with a couple friends yesterday, and a dinner last night with family. I made it through it all though and have a little more voice today than I have had in a week. It was a fun weekend despite my having no voice. Yesterday a couple friends and I went to see Dance Alive's Nutcracker Ballet. It was as beautiful and enchanting as I remembered it to be years ago when I went with my daughter. This was their 49th year performing it. The costumes are absolutely amazing! I love theater and it had been too long since I went to a performance of any kind. I can't wait to go again! 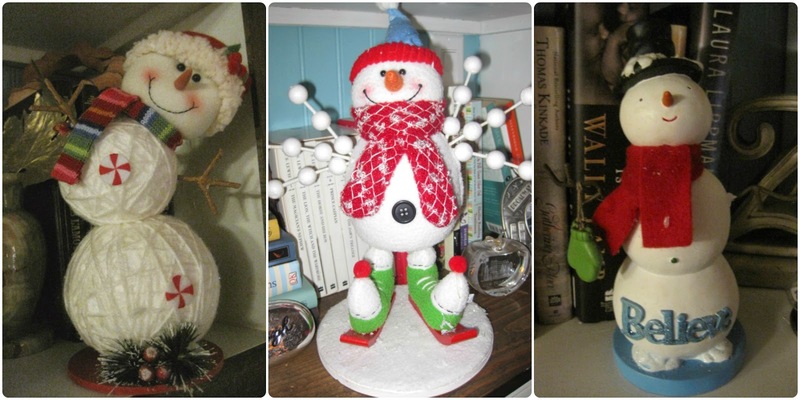 Anywho, today I am sharing my snowman collection with you. I have been collecting snowmen for several years now. It started with the teacher snowman you see in the photo below. My Aunt Loretta gave her to me years ago when I was going to school to become a teacher. The other little snowmen are my students...:) They are various ones that were gifted to me or ones I bought over the years. We'll start with my new snowman tree. For a couple years I have wanted a tree just for my snowman ornaments. This year I found a great deal at Michael's on their pencil trees, so I bought 2. I'll share the other one soon. I love my top hat tree topper on this one. I bought it on clearance at Cracker Barrel a couple years ago in hopes that it would eventually adorn my snowman tree. I snapped a few pictures of the tree starting at the top. These sweet guys sit at the bottom of the tree. The one on the left is a favorite. It has springs under it's sweater and bounces up and down. So sweet. The other one is a cookie jar that was a gift from my Secret Santa at school a few years ago. 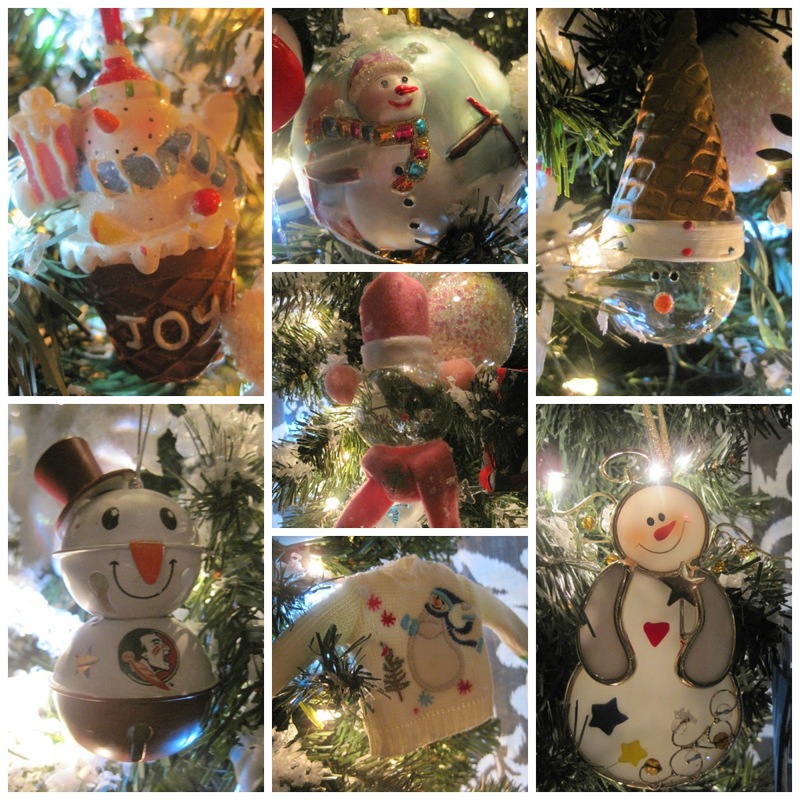 Here are a few of my favorite ornaments. The glass ball in the center, top row was a gift from my former principal several years ago when he was my Secret Santa. He passed away this year, so this one is special to me. The bottom left corner is my newest one, a gift from this year's Secret Santa. One of my all time favorite ornaments is the angel snowman in the bottom, right corner. It is stained glass and so pretty. It was also a gift from a former Secret Santa. The rest of my collection occupies my bookshelf this year. The one on the left with the red and white striped scarf is very special to me. It was a gift from my daughter, Miranda back in 2008. I love the snow globe too! These little guys make me smile....such happy little snowmen! The next four were gifts from Secret Santa's over the years, I hardly ever purchase one myself. This country snow angel holds a tea light. The trees are cutouts for the light to shine through. This metal one holds a tea light and is very pretty lit up. It is an angel too with holly leaf wings and a bird nest halo. This one is carved wood and hand painted. The jacket, jacket, scarf, and other accessories are made of metal and hand painted. Such a pretty snowman. This one holds three tea lights. This snow family looks like toasted marshmallows. I love this little bucket of "snowballs". The sign is a sweet ornament I bought several years ago. This little cutie sits by Miranda's photo taken on the lawn at FSU when she was a student there. So many sweet memories. My bookshelf also holds most of my vintage Christmas tree jars. They hold a variety of things. Candy, tiny pine cones, Styrofoam balls, & cinnamon sticks. I usually only put candies in them, but this year I decided to mix things up a bit. I have a few others scattered about as well. My favorite is the pedestal one on the far left. The one on the far right is a tiny one with a wooden base. I love that one too. That's it for today. Tomorrow I plan to share my other collection,....my gingerbread! Someday I will pass these two collections on to my children. Every year I try to talk myself out of dragging all of them out, but I just can't stand the thought of leaving them boxed up. It makes me sad. Silly I know, but I can't help it. I hope these little sweeties made you smile too. 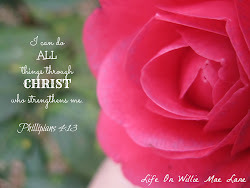 Have a wonderful Monday! I thoroughly enjoyed your photos and may I just say your bucket of snowballs is super cute! May you and your loved ones have a beautiful and very Merry Christmas. Love to you! Hi Vicky, I do hope you feel better soon. I love your snowman tree and the snow man collection on your shelves. So very festive and fun. I hope you enjoy your Christmas vacation. Wishing you a Merry Christmas and a Happy New Year! What a wonderful collection! They are all wonderful and look great displayed together. A great idea to have a tree just for snowmen...it looks lovely! So glad to hear you are feeling a little better Vicky. I am so sorry for you to be sick at such a busy time of the year. I am loving your snowman collection but I am in awe of your tree topper hat. I am pinning that picture as I would love to create one for the top of my tree! Hope you are 100 percent for Christmas my friend! What a wonderful collection Vicky, and so many memories to go with it. I'm so glad you're feeling better. That top hat tree topper is so fun. I love it! I hope you enjoy your Christmas break. Merry Christmas! Oh, I love that pencil tree all decorated with snowmen and the top hat tree topper is perfect! Have a very Merry Christmas Vicky! I love all your sweet snowmen. I have several friends who collect snowmen which makes them so easy to buy for at Christmas. I hope you are well soon. Teachers ALWAYS get sick right at the beginning of Christmas vacation. They hold it together for their students and then collapse. I hope you are in perfect health the rest of your break! 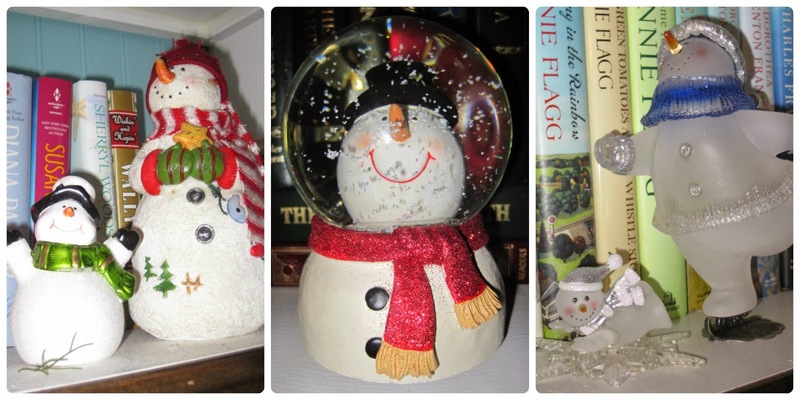 Vicky, I adore your Snowman collection! I love the little fellows myself! Your tree is adorable. It is so much work to haul it all out, but I miss my things if I don't bring them out each year. Love that tree! I'll have to keep an eye out for a good sale on one. Wishing you a Joyous Christmas. The cutest collection of snowmen! Isn't it great how friends and swappers feed our favorite things! Love theater and don't go often enough either. Been maybe ten years since I saw the nutcracker on stage.